SCARY HORROR STUFF: THE WATCHER IN THE WOODS Remake Will Be Coming to DVD From...WHERE? THE WATCHER IN THE WOODS Remake Will Be Coming to DVD From...WHERE? Ring around the rosies, it was.... Call me crazy, but I'm a bit baffled. How come I didn't know anything about this?? 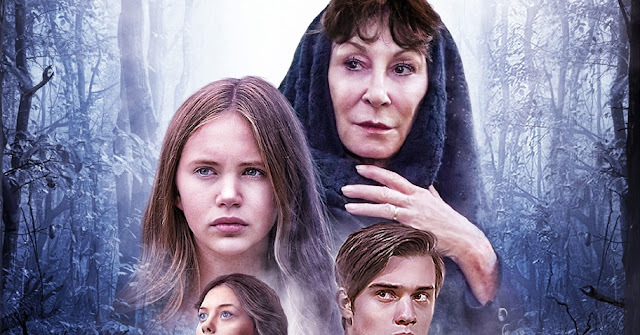 Well, it most likely was due to the fact that the remake starring the always fantastic Anjelica Huston debuted last year in October...on the Lifetime Channel! I Don't Have Anything Against the Lifetime Channel, Mind You.... But a DISNEY HORROR CLASSIC? It doesn't help that I generally don't watch cable, though. So this isn't a stab on Lifetime. But, hey, cool. You may have seen me mention something about this film (and book) before, having been adapted into a 1980 Disney horror film (for kids!) before. The truly iconic novel was done proud by the House of Mouse, for sure, as the movie gave me nightmares about mirrors and rings around the rosies for months after the fact. Not to mention an affinity for spelling a name on a window...backwards. Oh, yes. But I do have to say the trailer as you'll see here does show some interesting promise. It's eerie. Just like how the story should be. It perhaps did Lifetime well, which is why only a year later we're getting this remake on DVD. But as you know, I'm not against remakes. Above all iconic horror films, however, the true classics of my childhood do need to be left alone. But you never know: Anjelica Huston, man. Who knows: I may check out this remake of THE WATCHER OF THE WOODS and not have my entire childhood completely raped. Fun fact: this remake was directed by Melissa Joan Hart. Sabrina the f*cking teenage witch.